We’ve been hearing a lot over the past few years about how virtual reality has the potential to transform the way we learn and teach, from providing in-depth knowledge and helping us understand complex subjects to facilitating language immersion and virtual trips. Although in theory VR technology should be an amazing tool for learning and teaching, the reality is that it’s been slow to take off in educational settings, in large part due to the fact that it’s still so costly to implement. Even so, predictions are that by 2019 VR will start becoming mainstream, and some of the major players in the education and technology sectors including Google and Facebook are already pursuing applications for the classroom. 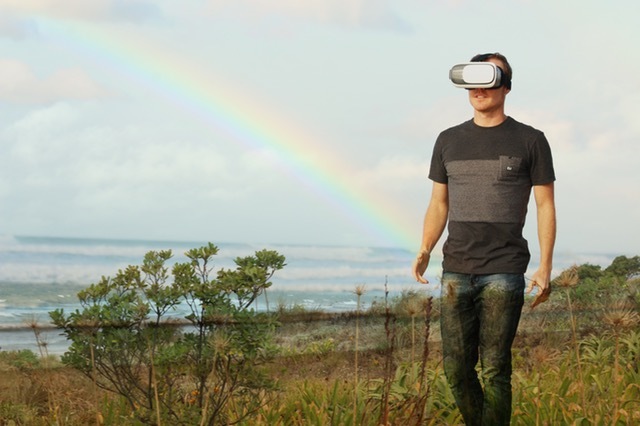 To give you an idea of how VR will eventually facilitate learning, we decided to take a look at some of the most notable examples of how virtual reality is already being used by schools and learning institutions around the world. Virtual field trips have become one of the most popular applications of VR technology for learning, and many schools have begun using Google Expeditions to transport students to faraway and even inaccessible parts of the planet. The Google Expedition app is free to download on IOS or Android and teachers can invest in some of the low-cost cardboard headsets that can be attached to a smartphone. With these simple headsets, students can actively explore anything from Machu Picchu to outer space or the deep sea. One of the best ways to learn a new language is through full immersion, as this requires students to listen to and speak the language they’re learning all day, every day. Since most of us can’t afford to jet off to another country for weeks or even months at a time, virtual immersion is the next best thing. Virtual reality simulations can trick the brain into thinking the experiences are real, and a number of new language learning apps that use VR are now being developed. One such app is Unimersiv, which can be used together with the Oculus Rift headset. The app allows learners to connect with people from all over the world and practise their language skills while playing games and interacting with other students in a virtual world. Virtual reality simulations can also help students learn practical skills, and one of the biggest benefits to training people in this way is that students can learn from realistic scenarios without the risk of practicing an unfamiliar skill in an uncontrolled real-life situation. An experiment carried out by Google’s Daydream labs found that people who got VR training learned faster and better than those who were merely shown video tutorials. The interactive learning experiment was aimed at teaching coffee making, and students were either shown a YouTube tutorial on how to pull espresso shots or allowed to practice it in VR. After training for as long as they liked, the students from both groups were asked to make coffee in the real world. Sure enough, the students who learned with VR made fewer mistakes and were quicker at pulling the espresso shots than those who watched the video tutorials. Even philosophical theories can be brought to life with virtual reality. The Sevenoaks School in the United Kingdom recently started using VR headsets in its philosophy lessons as a way to introduce students to French philosopher Rene Descartes’ dream argument. Meditations on First Philosophy is one of the most influential philosophical texts ever written, and begins with the claim that dreams and waking life can have the same content. Thanks to the VR headsets, students are able to see just how immersive a simulation can feel and experience firsthand the possibility that life is nothing more than a simulation. Schools are also finding that virtual reality technology is a great way to spark students’ creativity and keep them engaged, especially when it comes to architecture and design. For the last three years, David Beach, assistant professor at the Drury University Hammons School of Architecture, has been researching ways to apply VR technology in his field and believes it opens up countless possibilities in architectural design. The Oculus Rift hardware makes it possible for architects to take computer-generated 3D models and place viewers into those 3D models in order to bring their plans to life. At a primary school in Ireland, students have even been using VR to construct 3D models of historical Irish sites and then visit them virtually. The Jackson School for special needs students in Victoria, Australia has been using the Oculus Rift headset with students in the classroom. Technology and special education instructor Mathieu Marunczyn explains that the Oculus Rift has helped spark his students’ imagination and gives them a visual insight they wouldn’t otherwise have. For instance, students can take a peek inside an Egyptian temple or view a jet engine to gain an understanding of how it all fits together, which makes lessons a lot more hands on. Marunczyn also notes that structured lessons with meditative virtual reality apps like those that explore planets and stars tend to have a calming effect on his students, many of whom have some form of autism. Virtual reality technology also has huge potential in the distance learning industry, and a recent study from Penn State University researchers showed that VR technology can improve learning outcomes for online students. Stanford School of Business is already offering a certificate program delivered entirely through VR, and at the University the University of British Columbia Law School, students are enjoying virtual reality lectures using a VR social application called VR Chat. The application provides virtual online chat spaces where students with a VR headset can project themselves and interact with lecturers and other students. Virtual reality technology has the potential to greatly enhance collaboration between teachers and students, both in distance learning and classroom-based teaching. Research shows that virtual and augmented reality simulations increase student motivation and improve collaboration and knowledge construction. One study conducted in a virtual world called Second Life allowed teachers to design, create and use collaborative activities to introduce exchange students to Chinese language and culture before they went abroad. The students showed improvements in key areas including reduced embarrassment when practicing their language skills and better social interactions between students. Virtual reality will likely completely change the way games can be used for learning. Game-based learning works because in increases engagement and motivation, and virtual reality can take this to the next level. Jane Wilde, an instructor at Marlboro College in Vermont who has been using games and simulations in her lessons for some time now, notes that although virtual reality games are not the only source of fun and engagement in class, they can make a substantial difference. “In my own experience game-based learning is motivating because it is fun,” she says. “The playing field is leveled – a player’s gender, weight, race don’t have to interfere with their acceptance by other players. You are judged by your actions. Technology is changing the way students select universities and many schools have now started virtual reality campus tours as a way to connect with applicants on a wider scale. These campus ‘visits’ allow students to see what it would be like to attend universities in other cities and countries even if they can’t visit in person. The virtual reality tours use photos and videos of campuses and their surroundings that enable students to explore the campuses at 360-degree angles. For instance, the University of Michigan Football program now has a virtual reality tour that lets students experience what it’s like to play at the university’s stadium. Want to get a feel for what VR campus tours are like? Check out this list of virtual campus tours you don’t want to miss. Apps for Vitual Reality had a lot of support in all the fields like medical, mobile games, education, etc.. In fitness fields, this technology adds an exciting new dimension to the workouts and make us to feel like we were really running through the virtual environment. The VR gives a detailed information about the exercise that we do. This modern technology motivates people to exercise more. So true. My recent discovery and a favorite sport activity is a New Zealand South Island Run) Hardly likely I will have to try it for real in any near future, but when I do it with a VR, it seems soooooo real. And so nice. I just waited so long for this to happen. I think that everyone would agree they have been amazed by how real these virtual reality glasses make everything seem to you. I have seen a bunch of videos and the creators are working on this technology very fast. If there were more workshops and fairs where the educators would see how beneficial this device is, they would demand to have this in the classroom. Thanks for such informative and entertaining article. I will be looking forwarding to having these and using them to their fullest. Thank you for this concise compilation, Marianne! I just can’t find the “list of virtual campus tours” in the last paragraph. If you could kindly add that link that would be most appreciated. VR and AR provide good experiences of the real world in virtual. Thanks for sharing this information. Very interesting article. I am a big fan of virtual reality. I am very pleased that virtual reality is used in teaching my children. Several times I also took history lessons with the help of virtual reality. This is really cool. Did you know that, a quote from Wikipedia: “The exact origins of virtual reality are disputed, partly because of how difficult it has been to formulate a definition for the concept of an alternative existence. The development of perspective in Renaissance Europe created convincing depictions of spaces that did not exist, in what has been referred to as the “multiplying of artificial worlds”. Other elements of virtual reality appeared as early as the 1860s. Antonin Artaud took the view that illusion was not distinct from reality, advocating that spectators at a play should suspend disbelief and regard the drama on stage as reality. The first references to the more modern concept of virtual reality came from science fiction.”, source -https://en.wikipedia.org/wiki/Virtual_reality. Today millennials feel pretty comfortable with online education, doing research on the Internet, resorting to instructional videos on YouTube and distance learning powered by video technology. Obviously, virtual reality is next.